Image Size 10 x 12 in. I have wanted to be an artist for as long as I can remember. It wasn’t until grade 11 as a student at Beal Art that I took my first printmaking class. The first time I pulled a lino cut print was a pivotal moment for me and my future career as an artist and printmaking technician. The richness and graphic qualities that were revealed after pulling the paper off of the lino block had me hooked. 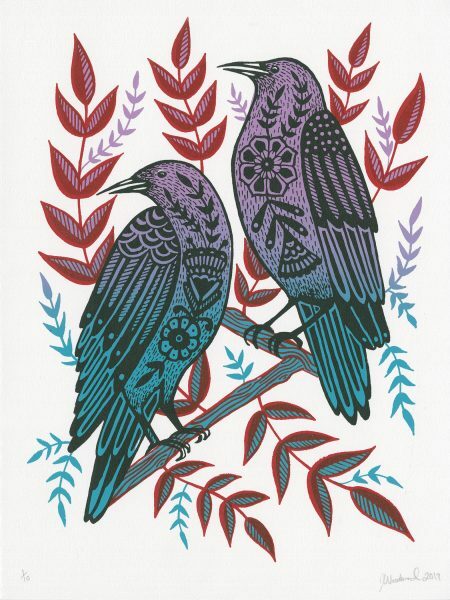 My practice involves printing limited edition lino cuts, etchings and silkscreens, hand printed shirts, totes and cards with imagery inspired by nature, animals, pattern and the passing of time. You can also find my art decorating the Palasad South and the Palasad Social Bowl, several local business and band logos and in the LCBO on Toboggan Breweries Lunatic Fridge beer.